On May 29, 1984 the Cincinnati Bengals and San Diego Chargers made a straight-up trade of disgruntled running backs, with the Bengals sending Pete Johnson to San Diego for James Brooks (pictured at right). 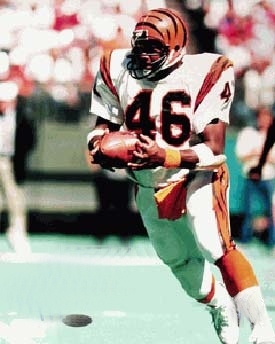 Johnson was 30 and had been taken by the Bengals in the second round out of Ohio State in 1977. He led Cincinnati in rushing in all seven years that he was with the team, totaling 5421 yards and making him the franchise’s all-time rushing leader at the time. He also was the club leader in career touchdowns with 70. A classic fullback at 6’0” and 252 pounds, Johnson’s best season came in 1981 as he rushed for 1077 yards, caught 46 passes for 320 more yards, and scored 16 TDs. He was named to the Pro Bowl and the offensively-potent Bengals won their first AFC title. In 1983, Johnson was suspended for the first four games of the season due to cocaine use (he and a teammate, DE Ross Browner, received immunity to testify in a federal trial regarding their purchase of cocaine from a Cincinnati plumber). He had reported late and overweight for training camp, but still rushed for 763 yards and tied for the AFC lead in rushing touchdowns (along with Seattle’s Curt Warner) with 14. Johnson (pictured below) was insisting on a contract re-negotiation and made clear that he would not stay in Cincinnati past its expiration in ’84, looking at the USFL as a possible alternative. He skipped a mandatory minicamp, likely the final straw for the front office. As for the 25-year-old Brooks, he was San Diego’s first draft choice in 1981 out of Auburn and led the NFL in all-purpose yardage in ’81 and ’82. Small and fast at 5’10” and 177 pounds, Brooks had been critical of his use by Head Coach Don Coryell in San Diego. “It started about the second game last season,” he explained. “I didn’t want them to put me at fullback…San Diego wanted me to block instead of letting me go one-on-one with linebackers in passing situations.” While he had received assurances from Coryell in minicamp that the team would run the ball more often, he was instead dealt to Cincinnati. In ’83, the Chargers were coming off their first losing season under Coryell, who had taken over as head coach during the 1978 season. The team went 6-10 and, among the many problems, star RB Chuck Muncie had a substandard performance. While he gained 886 yards and scored 13 touchdowns, he averaged 3.8 yards per carry, his lowest total with the Chargers and second-lowest of his eight-season career that began in New Orleans, and also fumbled eight times (as did Brooks). Meanwhile, the Bengals had a new head coach in the unorthodox Sam Wyche and were looking to open up the offense and provide a more varied running attack. The trade ended up being very one-sided in Cincinnati’s favor. Johnson failed to last the season in San Diego, performing badly over the course of three games (19 carries for 46 yards). He was dealt off to Miami where he finished up the year – and his career. James Brooks went on to have a long and outstanding stint with the Bengals. He started off slowly in ’84, still used more as the change-of-pace back that he had been in San Diego and running the ball just 103 times for 396 yards and catching 34 passes for 268 more while another big fullback, Larry Kinnebrew, and veteran Charles Alexander received more of the carries. But in 1985 Brooks was used more extensively and set a team record for total yards in a season as he rushed for 929 yards on 192 attempts (4.8 avg.) and caught 55 passes for 576 yards while scoring 12 touchdowns. In four of the next five years, Brooks was selected to the Pro Bowl and gained over a thousand yards rushing on three occasions, with a high of 1239 in ’89. His 1773 total yards in 1986 were also a career high in a season in which he led the NFL in average gain per carry (5.3 on 205 attempts for 1087 yards). He stayed in Cincinnati through 1991 and ended up rushing for 6447 yards (surpassing Johnson’s team mark) with a 4.8-yard average (he averaged over five yards per carry in each of his thousand-yard rushing seasons) and gaining another 3012 yards on 297 pass receptions (a fine 10.1 average out of the backfield) while totaling 64 touchdowns. 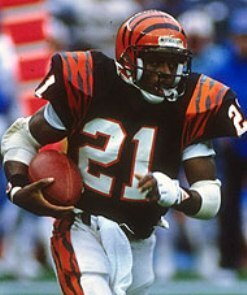 The Bengals also won a conference title along the way, in 1988, with Brooks effective but overshadowed by power-running rookie sensation Ickey Woods (who proved to have far less staying power). The combination of the two made Cincinnati the top running team in the NFL that season. But when Woods was lost to injury in ’89, the Bengals still led the league in rushing with Brooks carrying most of the load. He proved in Cincinnati that, despite the small size that had been considered a limiting factor in San Diego, he was a tough and dependable runner as well as an outstanding pass receiver. He also ended up having surprising longevity (he was 32 when last selected to the Pro Bowl for the 1990 season) and was one of the most productive all-around backs of his era.